I have been in the gun industry for 15 years and still love it!! Went to school in 2001-2003 for a Degree in Gunsmithing. I will never claim to know everything, it seems the more I learn the more I find out I still don't know. . . But If you have a question for a gunsmith I will answer or let you know That I have no idea and either find out or point you to someone who does know. My experience is in general gunsmithing and rifle building. Love history and collecting old military guns. Have built "tactical" rifles for the Coast Guard, State Dept, and many police departments from around the country. I have a fetish for the old S&W model 10. . . don't know why, I just do. So, anyway. . . ask away and I will answer!! Wondering what a good starting gun would be. Also what would a good book to understand the concepts behind guns are. When i say concepts i mean the physics behind ballistics, how an automatic pistol works, thinks like that. I have wanted to grab a gun to shoot with for a while. I am a student so money is a bit of an issue when it comes to my first one. Looking for a pistol maybe a .22 but i am not certain. I have a stock Glock 20 and was looking to replace the sights with something a little better. I like the Trijicon sights but see they have had a little controversy lately. Is there a better or comparable sight that you would recommend? Trijicon is the best option out there in my opinion. They did have a small batch that was bad but they warranted them all. I have never had a problem with them or their customer service. In a small industry like the gun industry, they stand out with their customer service. I have found them to be the strongest, best built night sights on the market right now. Hi! I have a Taurus 85 2inch barrel .38 special and I was wondering how I could go about making the trigger better. It feels gritty and the pull is too hard. I'm on a budget so taking it in to get a trigger job is out of the question. Thanks for providing info. You are a valuable source to the gun industry! Sorry for being gone so long!! The Taurus is a good gun. Nothing fancy, but serviceable. To make the trigger better there is a couple options. First is a trigger job. . .but you said that is too much sooo. . . You can get a spring kit for it and have it installed. The springs are about 15-20 retail and any good gunsmith shouldn't charge more then another 20 to put them in. Its an easy job. This will make it lighter, but it will still be a little rough. Cheapest thing to do to get the trigger pull smoother is to get yourself some snap caps. They are dummy rounds that have a spring primer on them so you can dry fire a gun and not hurt the fireing pin. 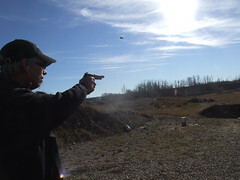 Then you give your trigger finger a real good workout pulling that trigger again and again and again and again!! That will smooth out the surfaces in the action that feel gritty. Its not as good as a trigger job, but it will improve the feel without the cost of taking it to a gunsmith. I've just recently re-entered the fire owning world, and got my Canadian Purchase and Acquisition License (PAL) for restricted and non-restricted firearms. I had given up my firearm collection in the 1990's, after I lost my hunting partner. My first pistol, with my new PAL, is a Regent 1911 A1 .45 copy (Turkish made). I use to own a Colt 1911 (pre-1926, not an A1), and had that tuned up to hit a 6" square target every time, at 100 meters. I noticed that with the Regent, I was lucky to hit the 100 meter 4" gong twice, out of a 7 round clip (more with one of my 10's), so I designed and built what I call my V-6 bushing compensator (I'm a hobby machinist). I had looked at other designs on the net, then came up with this one myself. Longer on the barrel than the stock bushing, and tighter in the slide, I now hit that 100 meter gong at least 5 of 7. I have another one in my head, with 2 more ports making it a V-8. Well, right there you have seen the quality difference of good machining and just good enough!! Thanks for sharing the pic! I love to see what people come up with. And the accuracy improvement you saw was the bushing/comp you made that is tighter. It is now holding the barrel tighter with the slide and sights. Fitting a new bushing for a 1911 is one of the most important things you can do for accuracy! Good job and keep tinkering! And here is a pic of a 1911 i build a few years ago. A friend of mine was sending pic after pic of custom 1911s to my phone with fancy leather and nice shiny blued slides. So I had to throw my "work" gun up on the table and take a few pics of it to send to him what a real gun looked like. Not some showpiece kept in a glass cabinet and brought out to impress friends!! My favorite "gun" is the 105mm Howitzer. For small stuff, my favorite rifle is the AKM, but AKs are prohibited in Canada now, and I don't have a permit for them. My favorite hunting rifle of all time, is the 1917 Lee-Enfield SMLE. Favorite pistol was my Colt 1911 (not a 1911-A1, but pre 1926) I owned in the 80' and 90's. While I do like my SKS and my CQ (AR15 clone), and other toys, those firearms were my favorites.